BOSTON (CBS) — Bill Belichick hasn’t yet begun his work on the Atlanta Falcons, whom his New England Patriots will face in two weeks in Super Bowl LI. It’s only been a few hours since Belichick and his Patriots dispatched the Pittsburgh Steelers 36-17 in the AFC Championship Game, securing the franchise’s ninth trip to the Super Bowl. Belichick didn’t even know it was the Falcons they’d be facing until after New England’s victory, but don’t fret, their prep work will begin soon enough. You can’t blame him for soaking in that AFC Championship just a little bit, as Belichick is now off to his record seventh Super Bowl as a head coach. But the victory may not be his favorite memory from Sunday night. That might be reserved for a postgame high-five with his good friend, Jon Bon Jovi. The head coach has had a long relationship with the rock star, which goes back to his days on the sidelines for the New York Giants. When Belichick blasts music during practice, there’s a good chance there’s a Bon Jovi tune — or ten — on the playlist. The media is always hard pressed to get much out of Belichick, but talking about Jovi and his music is something Bill loves to do. Possibly even more than breaking down kickoff returns for 20 minutes. Belichick says their friendship dates back to his time with the New York Giants, with Bon Jovi a huge Giants fan. Belichick said he was most impressed with the singing voices of New England fans when Jovi’s “Livin’ On A Prayer” played during Sunday’s game. Jovi love aside, Belichick was hard at work on Monday morning, breaking down film from New England’s win over Pittsburgh. He told reporters the team will begin their work on the NFC champion Falcons later on Monday. “We’ve only seen them a little bit this year on TV and haven’t really had them in many crossover games. But obviously a very good and very talented team and a number of people down there in that organization that I know and have worked with and I have a great deal of respect for them. But we’ll start digging into them before the day is over,” he said. 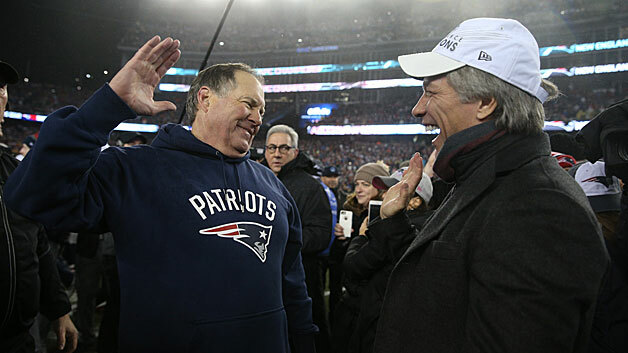 Hopefully, Bon Jovi will be in Houston in two weeks, and he and Belichick can share another postgame high-five. There are few things that can take Bill Belichick's eyes away from the football field. Apparently a Bon Jovi anthem is one of them. Jon Bon Jovi was in Robert Kraft's owner's box for last night's AFC Championship win over the Steelers. Late in the game, the rocker whipped Foxboro into a frenzy with a "Livin' on a Prayer" singalong. The crowd went nuts when Bon Jovi started singing on the big screen. Belichick has long been a friend of Bon Jovi's — and a fan of his music — so the Patriots coach admitted that he soaked the moment in. "I was definitely aware of it. Jon, man I've heard him play that song dozens of times. He had the place rocking, maybe a little more than we did," Belichick said. "Pretty impressive. He's a great friend, been a great friend for a long time. All the way back into the '80s. We shared a lot of great moments together, including the 1990 Super Bowl in Tampa when he was in the locker room after the game, taking crazy pictures and stuff like that. Great memories from there. "Great to have Jon here, always appreciate his great support. It was quite a moment, one that you usually don't see at a professional football game. It was special." Belichick explained that their friendship dates back to his days on the Giants coaching staff. Bon Jovi is from New Jersey and grew up a huge Giants fan, so he used to come by practice and hang out. Belichick cracked that Giants coach Bill Parcells wasn't the one handing out the invitations. "I don't think Bill (Parcells) was a big Bon Jovi fan or Bruce Springsteen fan or anything like that," Belichick said. "I don't think it was his musical style at that point in time. Some of the younger coaches on the staff connected with him — one in particular, connected to him." FOXBOROUGH -- During a timeout as the Patriots' rout of the Steelers commenced Sunday night, the stadium speakers blared Jon Bon Jovi's "Livin' on a Prayer" while the cameras captured quite the duo -- Rob Gronkowski and Bon Jovi himself -- belting out the song in their box seats. The entire stadium sang along. This moment was not lost on Bill Belichick, who would later embrace Bon Jovi following the 36-17 win. "He had the place rockin', maybe a little more than we did," Belichick said on his Monday conference call. "So, yeah, pretty impressive. He's a great friend, been a great friend for a long time, all the way back into the 80s, and we share a lot of great moments together, including the 1990 Super Bowl in Tampa. He was in the locker room after the game, taking crazy pictures and stuff like that. Great memories from there. It was great to have Jon here, and I always appreciate his great support and, yeah, it was quite a moment, one that you usually don't see in professional football games. So that was special." Asked by ESPN's Mike Reiss about his friendship with Bon Jovi, Belichick explained that they met when he coached with the Giants. "Jon's a big Giants fan -- he grew up in Jersey," Belichick said. "I was coaching the Giants. We both liked the Giants." Belichick noted that Bill Parcells, then the head coach of the Giants, was not a huge Bon Jovi or Bruce Springstein fan. "That wasn't exactly his musical style at that point in time," Belichick said. The trio of friends from those days: Belichick, Bon Jovi, and former Giants punter Sean Landeta. "Sean and Jon and I, we've done a few things together," Belichick said. Bon Jovi has made several appearances at Patriots training camps over the years. He was in attendance for a late August practice this past summer. 0 Response to "Belichick On Bon Jovi: ‘He Had [Gillette Stadium] Rocking’"